And yet another proud Pinay moment! I was one of the invited bloggers for Pearl Talk which I will be blogging soon. As a token, we were given limited edition Jewelmer bracelet which is currently on sale. Jewelmer is a local brand for cultured South Sea pearls. 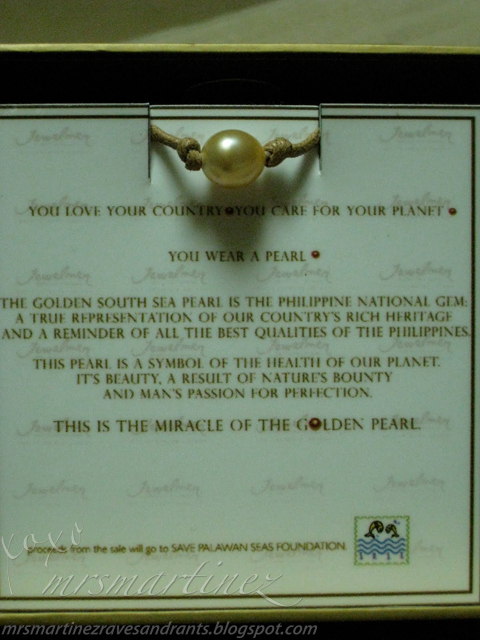 If you have been reading my blog, you know how fascinated I am with pearls and with this proudly Filipino owned company. You, too, can have this limited edition bracelet. Price starts at PhP2, 500. Proceeds from the sale will go to Save Palawan Seas Foundation. They can restring the bracelet for free! To see my earrings up close, click here. To know more about pearls, visit Pearl Talk 101.